Markets have shrugged off improvement in the Eurozone because more is needed for stability. Rising demand for German goods, an improving business climate and stability in Spanish housing should have given markets cause for celebration. However, after the substantial rally we’ve seen, and the headwinds yet to be tackled within the region, caution has crept back into markets. There is deep concern over Europe’s ability to kickstart growth, as austerity measures dampen economic expansion and a strong euro stifles exports. The increase in demand for German factory goods interestingly was driven by demand within the euro area. Domestic demand was weak and the currency still source of concern abroad. Furthermore, despite an overall improving business climate, uncertainty in the political and economic landscape going forward is causing delay in hiring and investment. Once again hitting the headlines, Spain could derail European stability, as corruption charges are directed at the government while they continue to grapple with a large budget deficit. The latest data points to a possible floor in Spanish housing prices but defaults on bank loans due to the real estate bubble remains elevated and there is only limited further financial aid available directly from the rescue fund. 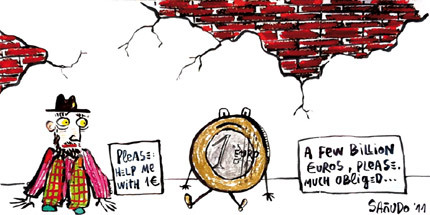 In order to meet its main obligation of lending to struggling countries, additional direct bank aid has been rumoured to amount to less than €100bn, nowhere near enough to contain future turmoil! With France expected to have slipped back into recession, Draghi, the European Central Bank President, is right to warn that the region is not in the clear yet. What’s needed now are structural reform and closer fiscal and political unity. Only with a return of confidence, based on improving fundamentals, can stability return. 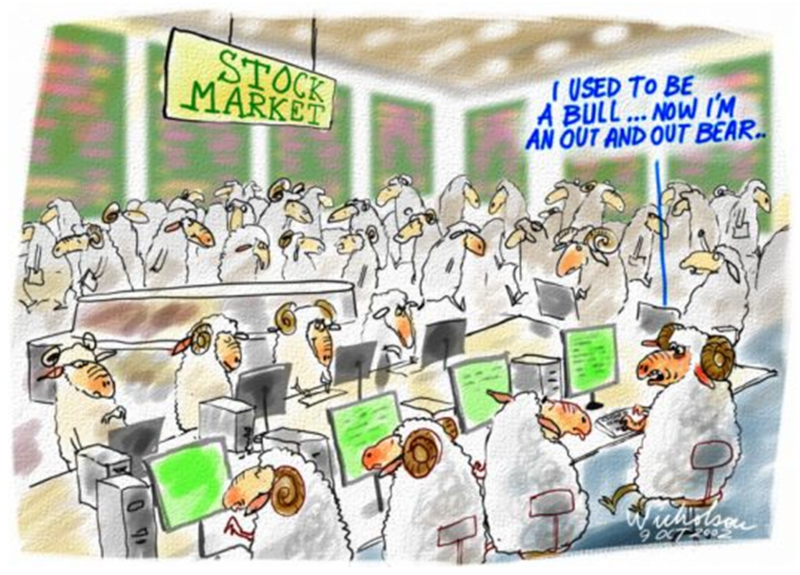 Bold words, high expectations and market rallies. We’ve seen steps in the right direction in Europe, but the 3 features that differentiate the latest bond buying program also highlight its flaws. It’s conditional but hard to police, transparent but uncertain, and unlimited but not long-term. The vicious circle is clear; a country will only get support if its economy deteriorates to the extent they will accept onerous conditions which will cause it to sink deeper into recession. With multiple significant flaws present in current plans, enough has been done to buoy markets but more is needed to support economic progress and bring sufficient confidence back to markets. With bold statements come high expectations and Draghi, the European Central Bank President, has been acutely aware of this fact. After claiming he would do “whatever it takes” to save the euro, the pressure was on to support this with a decisive plan of action. Earlier this month he seemed to do just that, promising to launch an unlimited bond-buying program to ease pressure on sovereign borrowing costs. Taken positively by the markets, the Eurostoxx closed up over 2% that day and periphery sovereign bond yields fell on the news alone. 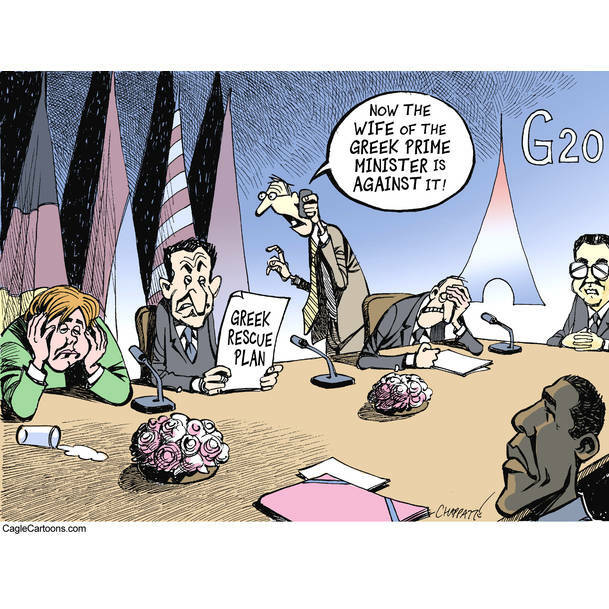 However, the question remains: has this really marked the end of the Eurozone crisis? The rally has taken bank shares and CDSs back to where they stood in March, when markets similarly put faith in cheap 3-year ECB loans, only to be disappointed. Are markets at risk of a correction this time too? To allay (German) worries of long-lasting and repeated requests for help, the support provided by the ECB will come with conditions. The ECB will buy bonds of countries that request help, as long as they conform to certain terms. Countries will be charged with specific requirements, e.g. spending cuts, to try and build fiscal discipline so assistance can wind down. The conditional nature of any offer to support a country’s government bonds could however also be cause for concern. It is hard to police. The resultant turmoil that would ensue from a country not only having identified themselves as in need of help, but now having that help withdrawn would extend beyond the country in question. This would therefore be mutually destructive. With investors fleeing from any asset perceived to be exposed to this country as they looked to de-risk portfolios, ECB assets could be damaged, lowering their resolve to enact this punishment. Moreover, this unintentionally maps out the road to a euro exit. It highlights that once a country that has received a bailout no longer meets specific targets, the rug may be pulled out from underneath it and the resulting pressure could force it out of the euro. The ECB will be transparent about which country’s bonds they are buying, reducing speculation and giving markets a clearer indication of what’s going on. However, this doesn’t mean the picture would be crystal clear. Uncertainty remains as to the exact level at which bond-buying could be triggered and the conditions that would be put in place. There is no cap on the amount of bonds that can be bought and therefore it can provide some form of support long into the future. However, this does not equate to a long term solution. Buying bonds is not a substitute for reform or a strategy for economic growth, which Draghi himself stated has “risk to the downside”. Both of which are crucial for the health of Europe and an end to the crisis. Finally, although not corresponding to anything stated as a benefit of the plan, it was not unanimous. The German Bundesbank President was not in favour of the plan and could still cause trouble. Indeed, it has since been ruled that Germany has the right to vote over every rescue programme. Considering the country’s fondness for austerity, bailout terms could be tougher and either rejected, damage the economy further, or accepted and failed to be followed. The vicious circle is clear; a country will only get support if its economy deteriorates to the extent they will accept onerous conditions which will cause it to sink deeper into recession. With multiple significant flaws present in current plans, enough has been done to buoy markets but more is needed to support economic progress further down the line and bring sufficient confidence back to markets. Will the French and Greek election results change the direction of Europe? As French and Greek voters make their feeling about spending cuts loud and clear, we ask ourselves – why has there been such a strong swing to anti-austerity/pro-growth, how does this threaten the survival of the euro and is a Greek default still possible? The deepening slump has dampened deficit reduction, the Fiscal treaty hangs in the balance and patience is wearing thin. Crucially, according to voters and investors, time is running out. Francois Hollande’s victory in the French elections marks a significant change of focus in European politics. In contrast to the rhetoric delivered up to this point, Hollande wants emphasis of policy to be on growth instead of austerity. Why does he want this? Because the situation is deteriorating. Unless a country grows, their debt burden, as a percentage of a decreasing national output, grows and is therefore harder to manage. As iterated by French Socialist lawmaker Arnaud Montebourg, in an interview with BFMTV “Austerity is everywhere and it’s a complete shipwreck,”. Portugal and Spain are prime examples. While the Portuguese economy is expected to contract by 3.3% this year, the deepening slump is dampening deficit reduction. In fact, the deficit almost tripled in the first couple of months of this year alone. Spain, similarly, is struggling with a deteriorating debt situation. As almost 1 in 4 are without jobs, unemployment is boosting defaults. 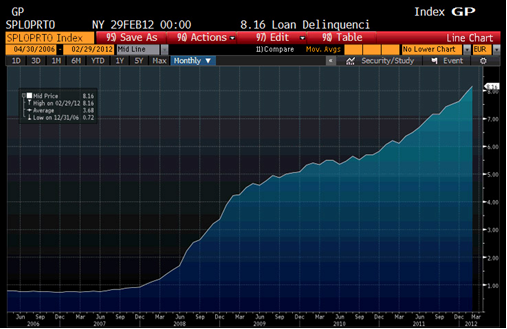 Bad loan ratios have reached a 17 year high (see chart below on the right). However, such a drastic change of attitude could damage the Franco-German Alliance, political progress and the very survival of the euro. This is because for Hollande to promote growth, he is threatening the fiscal treaty, perceived as crucial for keeping the euro together in its current form. The Treaty would create closer consolidation within the European union. Handing over authority for National Budgets to a Supra-National entity could ensure the various moving parts of the region interact better as a whole. However, Hollande disagrees with the primary focus on debt and deficit limits, without any pro-growth measures. Whilst the German Finance Minister Wolfgang Schaeuble is ready to discuss initiatives to boost economic growth Merkel has said she will not renegotiate the pact. As her spokesperson asserted, it “has already been signed by 25 out of 27 EU countries”. Instead the likelihood may be a growth pact attached to the fiscal pact. Nevertheless, the problems don’t end there. Firstly, Hollande will have his work cut out for him in an economy that is barely growing, with jobless claims at their highest in 12 years and a rising debt load that keeps France vulnerable. Secondly, can both sides agree what they mean by growth? France and Germany disagree strongly on how to achieve growth. Merkel maintains it is through structural reforms – making it easier to fire workers, which would encourage employers to hire, certainly a key aim for the Italian Government. 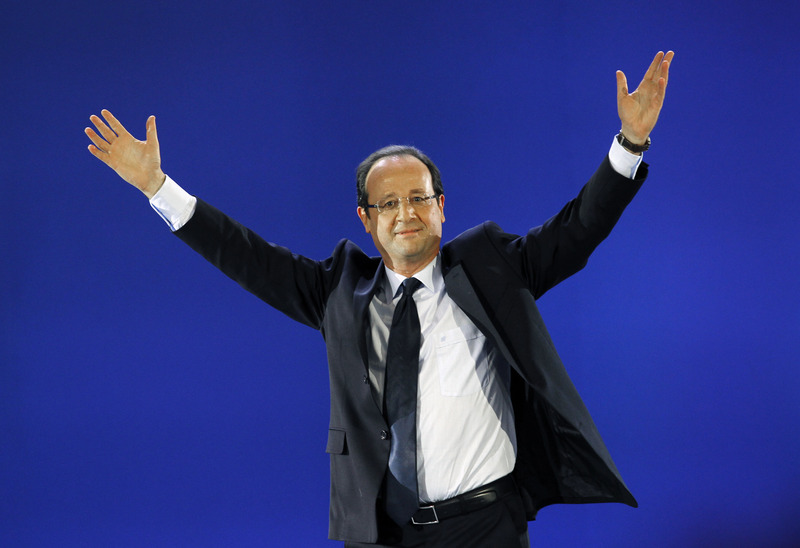 However, Hollande is hesitant and instead wants growth via infrastructure spending. 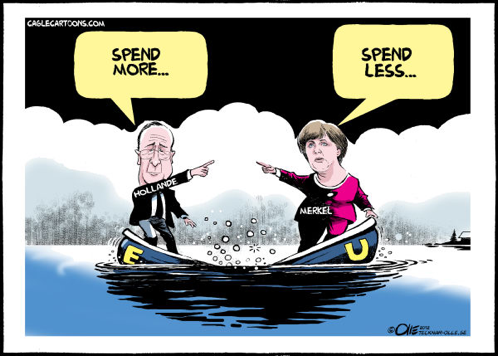 But Germany won’t agree to spending funded by borrowing – exactly opposite to their deficit reduction targets. Therefore, again although rhetoric can be applauded, practical plans remain elusive. Uncertainty continues to be a key challenge for Greece as voters in a similar move to the French, overwhelmingly rejected mainstream candidates supporting spending cuts. Crucially, these cuts were aimed at securing bailouts and avoiding a default. 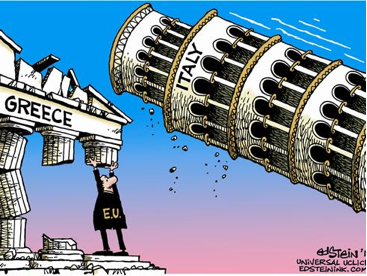 Instead, 70 per cent of voters supported parties that promised to tear up the bailout and attempts may be made to negotiate a gradual ”disengagement” from the harshest austerity measures of Greece’s €130 billion ($168 billion) bailout. This keeps the possibility of a Greek default firmly in the picture and until a coalition is formed, a new election next month is possible. Will there be enough time for political leaders to regain credibility and encourage Eurozone growth? As confidence wanes, borrowing costs rise and debt burdens risk becoming unsustainable. Worryingly, therefore, patience is running thin. Echoing Margaret Thatcher’s thoughts on a unified Europe as “the vanity of intellectuals, an inevitable failure: only the scale of final damage is in doubt”, the German paper, Die Welt, wrote after the French and Greek elections: “In the end the results are proof that Europe doesn’t work”. As European markets suffer the longest losing streak since November, the correction is a healthy one. The index is still up over 8% this year, despite many of the region’s problems remaining unsolved. The latest disappointment, a manufacturing industry contracting more than forecast, is merely the next knock in an overall shrinking group of countries. Just this month the European Central Bank reduced the outlook for growth this year to a 0.1% contraction, keeping the region in recession. As expressed by Tim Geitner in the US, Europe is “only at beginning of a very tough, very long, hard road”. Crucial for Italy to restore confidence in their markets and bring down hefty borrowing costs is the structural reform of its labour laws. The country’s growth has lagged the euro average for more than a decade and with unemployment at the highest level since 2001 (9.2%), the fear is they will be left further and further behind. Unfortunately, talks between government and union have failed to ease firing laws, which would stop older workers being protected to the detriment of the youth (suffering from a massive 30% unemployment rate) and encourage hiring. With elections early next year, the time for progress is running out. Portugal, seen as the next card to fall after Greece, succeeded in auctioning 4 month bills at the lowest yield since late 2010. Demand for these bonds reached 7 times the amount on offer, implying investors were sufficiently confident on the short term outlook for the country. Nevertheless, long term bond yields remain elevated, with investors requiring 12.5% to lend to Italy for 10 years. With a 3.3% economic contraction expected this year, unemployment at 14.8% and strikes over pay, welfare cuts and tax hikes, the long-term outlook is yet to be rosy. The deepening slump has dampened deficit reduction, with the figures almost tripling in the first two months of this year. The fear is more rescue funds will eventually be needed. Interestingly, despite the potential pitfalls, the ECB seems to be scaling back certain bond purchases. Prior to the recent Long-Term Refinancing Operations (LTRO), a measure to buy €40bn of bonds was set. Since then, only €9bn has been bought and the policy expected to last until autumn may be wound down sooner. This is understandable with LTRO, injecting a whopping €1tn of liquidity having made this ‘gesture’ obsolete. Furthermore, a member of the ECB has proclaimed that it “has done its part now governments must do theirs”. A move towards letting banks stand on their own two feet is the long-term strategy for stability, but with potential for risk to re-erupt, they had better step cautiously.